I’ve had wedding fever since my beautiful cousin got married a few weeks ago. So even more than usual, I’ve been browsing wedding photos, ideas and styles. One of the most exciting parts of wedding planning is deciding on the dresses. Of course every girl anxiously anticipates finding her wedding gown, but finding the perfect bridesmaid dresses can be just as fun! For a summer wedding, you can’t go wrong with pretty pastels as your color scheme. Right now, yellow is a very popular wedding choice. 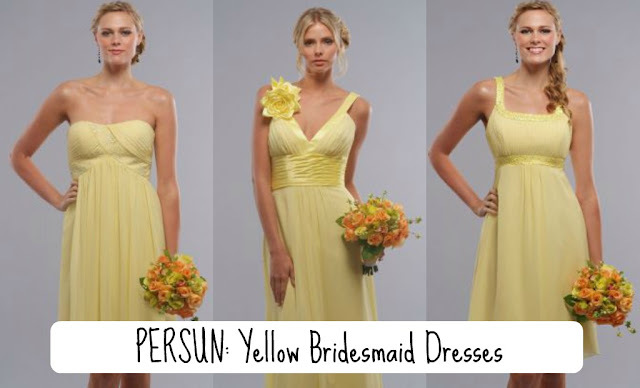 Persun has a wonderful selection of yellow bridesmaid dresses. A cheerful, sunny yellow color on your bridesmaids will make the whole audience smile. For a vintage style wedding, light butter yellow dresses would be fitting. For a trendier wedding style, brighter, lemon yellow dresses would be stunning. Pair those lemon yellow dresses with gray tones for a modern twist and an awesome color scheme! If you want your wedding to be the event of the year, choose bold, neon yellow dresses to make a real fashion statement. Whatever shade of yellow you choose, the dresses will set the joyful mood for your big day! You’ve found the love of your life, what color is better than yellow to express that kind of happiness? Your bridesmaids will light up the room with their yellow dresses and the color is linked to a feel-good vibe. Everyone will be walkin’ on sunshine at your wedding, while you shine! This entry was posted in Formal Dresses Australia on June 14, 2013 by persunau.